Sea turtles are one of the island’s most famous inhabitants. If you are planning a trip to Cyprus and would like to see marine turtles, there are multiple nesting beaches in the North Cyprus including the must-see beauty of Golden Sands on the Karpaz Peninsula . Also Alagadi nesting beach is a specially protected area and is closed to the public at night during the hours of 20:00-08:00 during the nesting season to lay their eggs, about 40 cm down. The Ministry of Environment of Cyprus works together with The Centre for Ecology and Conservation at The University of Exeter in Cornwall to monitor turtles and work for their survival. Marine biology students’ volunteers here from all over the world work for the Turtle Project. Each breeding season they are helping monitor and protect the nesting turtles protecting and caging the nesting areas against foxes and other predators. 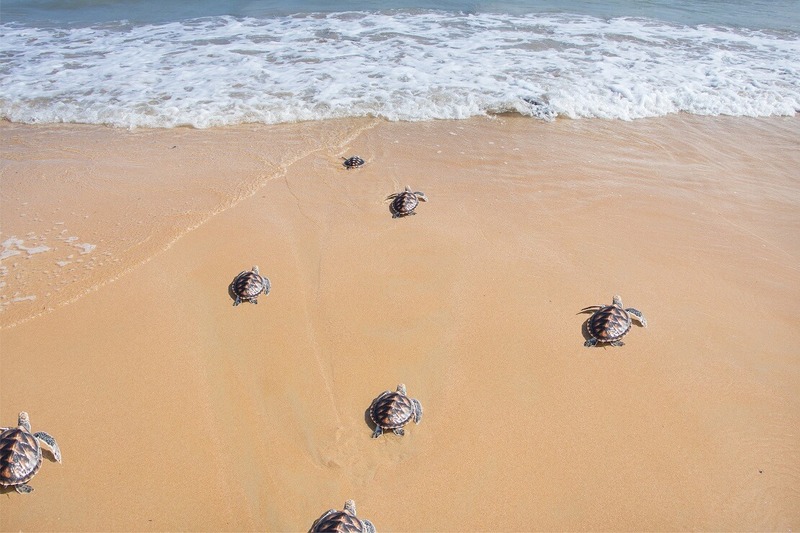 They also organize public viewings of baby turtles releases, starting at about 5.30pm most evenings. (Booking is essential) you will be able to experience this unique happening several times. There is usually the opportunity for each visitor to handle and release a hatchling. The best times to observe the nesting is at the end of June and beginning of July, The hatching season peaks around August to September where hatchlings turtle.